Perfect for internet chatting, VOIP, or "Skype!" Plug and Play Adjustable Base Compact and Lightweight Professional look and performance Crystal clear voice vocal clarity. Perfect for internet voice chat with 3.5 mm audio plug. Compatible with all PC Models with any Windows operating systems. 1 Year Warranty. Experience plug-and-play convenience and enhanced digital audio quality with the Stand Alone Desktop Microphone. With 3.5 mm audio connectivity and noise-canceling technology to filter out unwanted background noise. The microphone delivers enhanced digital voice recognition, voice command, voice recording and more. It also features pivots on base to hold preferred position and a mute switch for easy control. 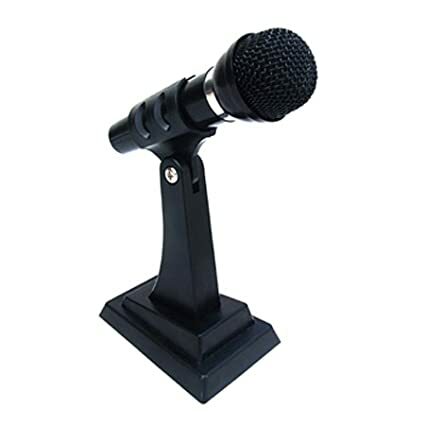 Featuring a sleek and compact design, the microphone forms an ideal digital audio accessory for your desktop.Its wide frequency response (40Hz-16000Hz) and tight cardioid polar pattern are ideal for close-in miking of speakers.The Vocal Microphone is one of the most popular professional reliable, natural-sounding Vocal Microphones of all time. Contents:PC Microphone, Holder Stand Base. Requirements:Microphone 3.5 mm audio plug. Please note that this is a PC microphone, does not work with Mac computers. Overall, it's really well put together for the price point. I was expecting much worse, and was pleasantly surprised. 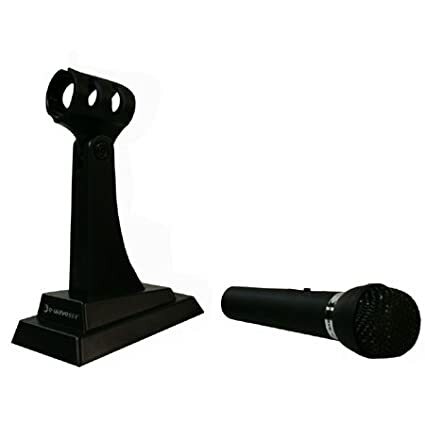 The stand is plastic and unweighted, however the mic doesn't tip over easily. On the bottom are non-slip rubber feet, which helps. The holder swivels up and down, and it uses a metal bolt as the axle. The mic itself has a metal basket, and has a little weight to it. There's an on-off switch on the mic itself. My only concern about the build is that the on-off switch has to be inside the split on the stand, or it'll turn your mic on with a slight bump if in the off position. With it in that split, it's difficult to turn on and off. The cord is generous in length and it is UNSHIELDED. 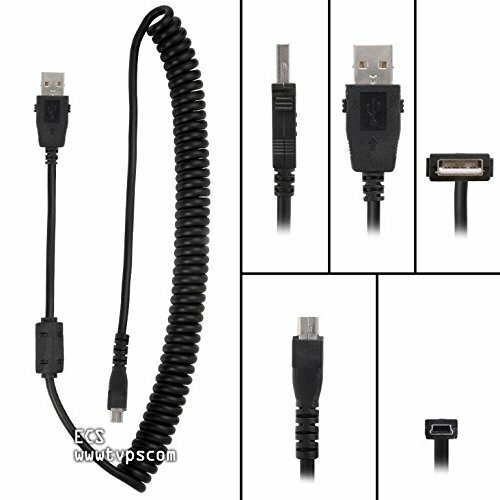 The cord ends in a 3 terminal 3.5mm plug. It does not use a standard mic end, which is 2 terminal. It did not work with my on-board mic jack at all, but works fine with my creative labs sound card. It's better than a Logitech desktop mic I've had for several years, with a caveat which I'll explain later. It picks up well. It's more or less omnidirectional. I have a television sitting at a 130 degree angle from the front of the mic, and it barely picks up. If I turn the mic to about 90 degrees with respect to the tv, it picks up the tv enough to upset my ventrilo friends. I can be heard clearly, with little static and having the mic positioned 3 feet from my face. The caveat to quality is the cord picks up ANY noise from ANY nearby power cords. I really mean this. The cord can NOT be anywhere near ANY cord carrying power to ANYTHING. Trying to run it behind the desk picked up a very notable hum from the monitor power supplies. Along the floor picked up from the UPS. The only way I managed to get it to not have a very loud and obnoxious hum was to run it around where it wasn't close to anything, but nor was it close to my desk. 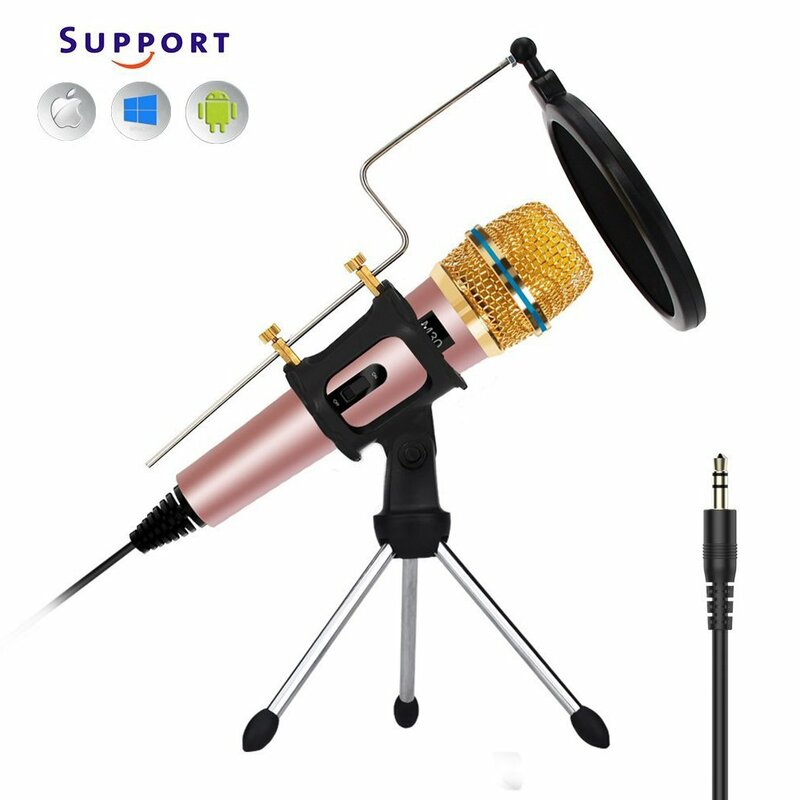 If you've got a soldering iron, and access to shielded mic cable, it's really easy to replace the cable with a shielded mic cable. If you use a shielded cable, the hum vanishes. You'll be able to position it anywhere without worry about picking up the dreaded hum. Without shielding, people will think you sound like "you're talking underwater next to a power plant" if you have the cord near any power cords. With shielding, they'll comment how nice your mic is. I paid $8 to a local A/V supplier for a 6 foot shielded cable with a standard 2 terminal 3.5mm mic end, and it took me 15 minutes to desolder the old cable and solder the new one in place, including time to let the iron heat up. Without replacing the cable on the microphone, it's very poor for desktop computer use. In a location WITHOUT power cords, it'd be good for its price, but you'd still have to worry about where the cord was laying. 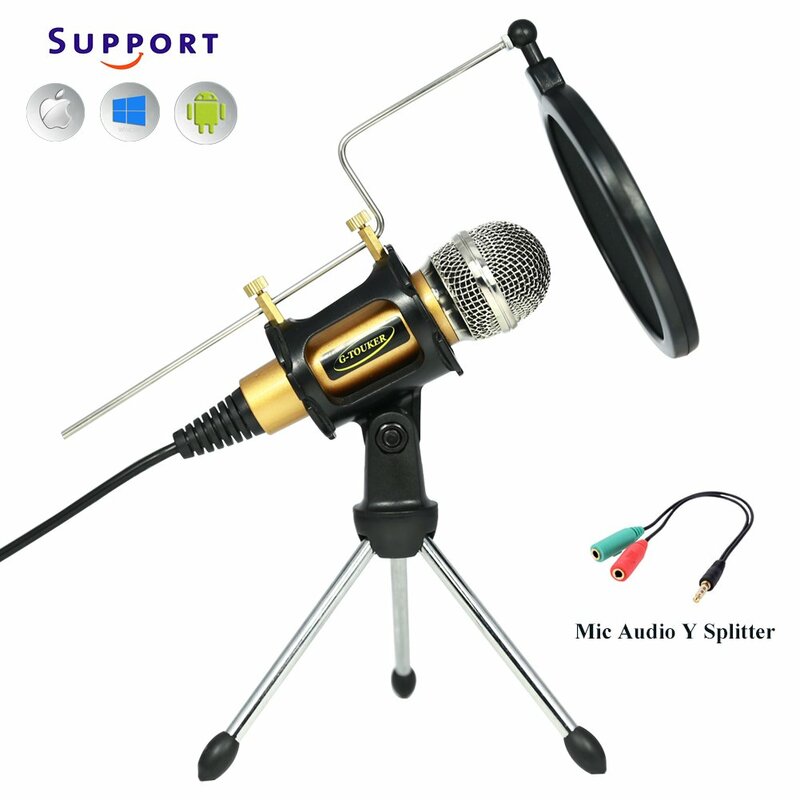 Adding an additional $8 replacement part for the cord, replacing the cord with a shielded mic cable, it's very very easy to make the mic wonderful for desktop use. When I was at $14 invested for the mic, I had to switch back to 'old trusty' to be heard clearly. After investing a total of $22 (mic and aftermarket shielded mic cable), it gets better reviews from my peers than another person's Shure 522, which is 5X the price. Would I purchase it again? In a heartbeat, with a shielded mic cable in the same order. How it arrived in the box, I can only give it 2 stars. With a simple cable replacement, it'd get 5 stars, but that's not what is delivered. I needed an external mic for a laptop that had all the USB ports disabled. I tried out one other external mic before this one, and this one is much better. While it still gives a little background noise/interference, it gives much less than the other mic I tried for about the same price. This omni-directional mic does a good job of cancelling noise and is as good as I expected a non-powered microphone to be. This hooks into the 3.5mm mic jack on our laptop and captures pretty good spoken voice audio with relatively low background noise. 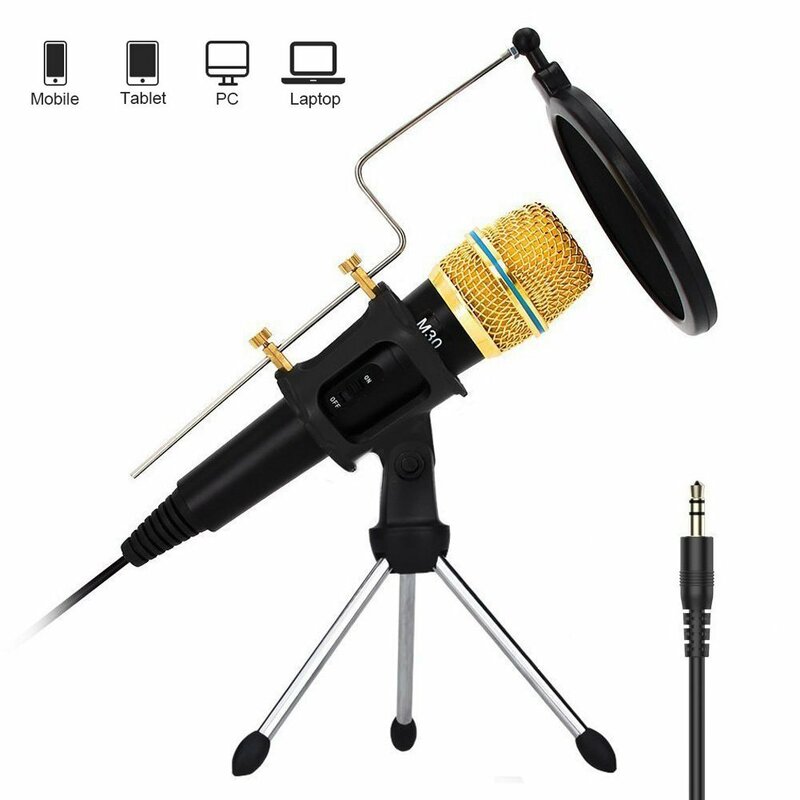 I would buy this mic again (and I might if another solution doesn't pan out for the other 3 laptops we need to wire for sound but which have disabled USB ports). Worth the purchase for the purpose. I bought 30 for my classroom for students to work on recording on multimedia platforms in my technology course. The packaging was very nice and sturdy, with a plastic mold insert for the mic to rest in,which is how I plan to store them. Instructions came with but it's easy enough to use. There's an on/off switch on mic which alleviates having to reset the computer settings when done. A long chord is available for video recordings away from computer. It's small and lightweight. It's not truly noise canceling depending on the sound boost settings on computer. I found that the higher the sound boost settings, the more the mic picked up, including ambient sounds. Lowering the boost increased the noise canceling qualities. It is way better than what we use to have. Also, the recording quality is clear and static free. Best when mic is right in front of mouth but it is not necessary to get a recording. Great for beginner or student use and can work well with higher quality of sound based on software you're recording with. Go to your windows control panel, find your microphone settings, and activate a MAXIMUM boost (+10.0 db I think) of your microphone input or else people will not be able to hear you clearly in games or Skype unless you raise your voice. On top of that, you'll want to pretty much max out your game's VOIP settings. Since picking up this clever microphone I have noticed that people in online games can understand me much better. In games where communication is vital to success this will give you a winning edge. In games that promote socializing, you will find that your friends will hear every nuance of your voice as if you were in the room with them more or less. Fifteen dollars is a freaking steal. The mic stand design of this mic makes it very unobtrusive and intuitive. If someone else is next to you while you're gaming, they can chime into the mic without leaning awkwardly close to your face. You also don't have to wear a geeky headset and you may even feel like a comedian or something talking into this little gizmo XD.